There are 3 ways of amortizing Capital assets over their useful lives. We shall describe each one in depth below. a) First calculate the amortization cost by subtracting the asset’s salvage or residual value from its total cost. b) Secondly, divide this difference by # of years this asset will be useful. Consider BB Company purchased a high-end computer on January 1st, 2004 for $15,000 and used it throughout its predicted useful life of 5 years, through to December 31st, 2008. The salvage value is expected to be $3,000. Here is the accounting entry to be made at the end of December 31st, 2004, after using the computer for 1 year. Entry to record single-line amortization of of $2,400 per year for a 5 year useful life. The debit to Amortization expense appears on the Income Statement in the Operating expenses section. The Credit to Accumulated Amortization appears below the Computer Equipment Asset account as a Contra-asset account. Remember through Accumulated Amortization, we are keeping track of the reduction in value of the Computer Asset control account. This is why accumulated amortization is a contra-asset account. Here’s how these entries are reflected on the Balance sheet. In order to save space on the balance sheet, many organizations list the Computer Equipment asset net of accumulated amortization. This means the accumulated amortization has already been subtracted from the asset account, here’s how it looks. *** Note the $3,000 is the ending Book Value of the asset on December 31st, 2008. Note also that this number is NOT $0. Why? This is because we do not amortize an asset below its salvage value. i) Amortization expense is $2,400 throughout all the 5 years. ii) Accumulated Amortization is the sum of prior period’s amortization + current period amortization expense. iii) The book value goes down every year and equals the salvage value at the end of the asset’s useful life. 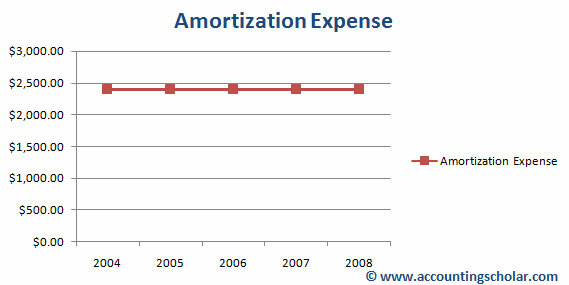 This chart shows the linear amortization expense of $2,400 per year that the company incurs; this amortization expense is recorded on the Income statement as a non-cash expense. This chart shows the decline in book value (recorded value) of the capital asset declining at a pace of $2,400 per year on a linear basis. 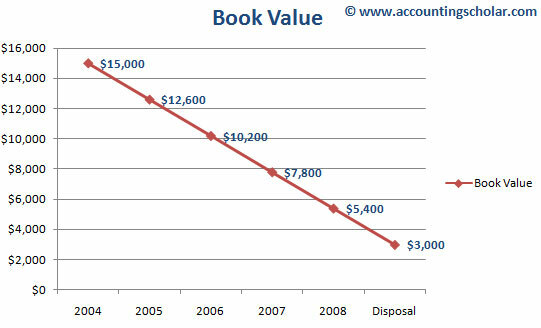 Note the graph shows that the ending book value of the asset will be $3,000 in 2008 and beyond upon which it is disposed.